You can read part 1 of todays live blog here. Update 02:15am NoG20 Hamburg: We go out now to get some sleep. Tomorrow we will be back with another Live Blog. Take care! Update 02:08am NoG20 Hamburg: More and more riot cop squads leave the Schanze district. Update 02:03am NoG20 Hamburg: Many people with injuries inside Rote Flora. Update 01:48am NoG20 Hamburg: The false report from SEK cops storming Rote Flora came from Reuters. Update 01:03am NoG20 Hamburg: Photo journo Sören Kohlhuber writes that SEK cop pointed his gun on him when he tried to make a picture of the SEK cop. Update 0047am NoG20 Hamburg: Cops are not allowing to film and even threatened journalists. But some people continue to film anyway. Update 0038am No G20 Hamburg: Image of a member of SEK special forces in Schanze district little bit earlier. Update 00:21am NoG20 Hamburg: Special police forces with machine guns are storming the Rote Flora. NOT CONFIRMED!!!! Update 00:10am NoG20 Hamburg: Cops asked media not to document ongoing polive operation at Schanze. Jornos asked if press freedom is now completely abolished in Germany. Update 00:07am NoG20 Hamburg: Livestream shows special police forces with machine guns on roofs in Schanze district. Update 11:56pm NoG20 Hamburg: Reuters livestream shows cops going into Schanze district: here. Update 11:31pm Pictures of SEK special police squad with machine guns just outside Schanze district are going round on Twitter. Update 11:26pm NoG20 Hamburg: Riot cops are reinforcing just outside Schanze district. Livestream from inside the Schanze district: here. Update 11:00pm NoG20 Hamburg: Critical mass cycling demo against G20 is still riding. Update 22:30pm NoG20 Hamburg: Video from earlier today; Riot cops drag an injured and unconscious person over the ground. Update 10:15pm NoG20 Hamburg: Livestream of the clashes in the Schanze district. Update 10:11pm NoG20 Hamburg: Video of the warn shot being fired by a cop we reported earlier about. Update 09:54pm NoG20 Hamburg:: Livestream from clashes at Lerchenstr: here. Update 09:53pm NoG20 Hamburg: In the Schanze district Rewe and Budni stores are plundered. Update 09:50pm NoG20 Hamburg: Livestream from revolutionary demo at Reeperbahn: here. Update 09:18pm NoG20 Hamburg: Descalation by cops… ACAB! Update 08:50pm NoG20 Hamburg: Situation at Pferdemarkt is totally out of control. Cops dont have enough riot squads here. Scaffolds become firewood. Update 08:50pm NoG20 Hamburg: Confirmed information that one G20 delegation had to return to their hotel because of the blockades. Update 08:25pm NoG20 Hamburg: Riot cops back at Pferdemarkt (Video Tweet below). Update 08:22pm NoG20 Hamburg: Riotcops at Pferedemarkt running away in livestream. Update 08:15pm No G20 Hamburg Warning shot: According to this livestream it was a cop in plain clothes who was identified by activists. Update 08:00pm NoG20 Hamburg: Twitter account from cops fom Hamburg, @PolizeiHamburg tweeted that a cop was attacked at Schanzen district. The cop fired a warn shot with live ammo and fled into a store after that. Update 07:40pm NoG20 Hamburg: Cops attack in livestream; here. Update 07:31pm NoG20 Hamburg: Water canons to disperse people that blocked Japanese G20 delegation. Update 07:20pm NoG20 Hamburg: Convoy of japanese G20 delegation blocked near Millerntor. 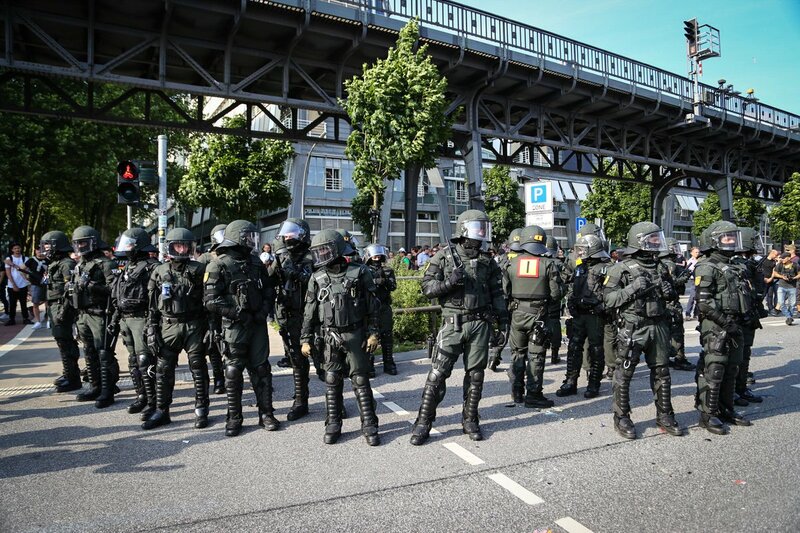 Update 07:20pm NoG20 Hamburg: Riot cops around Sankt Pauli stadium (tweeted pics below). Media center and antifa kitchen is there. Update 07:13pm NoG20 Hamburg. Clashes at Landungsbrücken a little bit earlier tonight. Update 07:13pm NoG20 Hamburg. Clashes at Landungsbrücken a little bit earlier tonight. Images by Tim Lüdermann. Update 06:40pm NoG20 Hamburg: Riot cops attack neighbours at Hein Kölisch square, throw a man from his bicycle, shove people to the ground and retreat again. We will continue our live blog on this page now. After #RoteFlora, #NoG20 & #CologneForAfrin Demos in #Germany: How can we Respond to The Authoritarian State? – Enough is Enough!